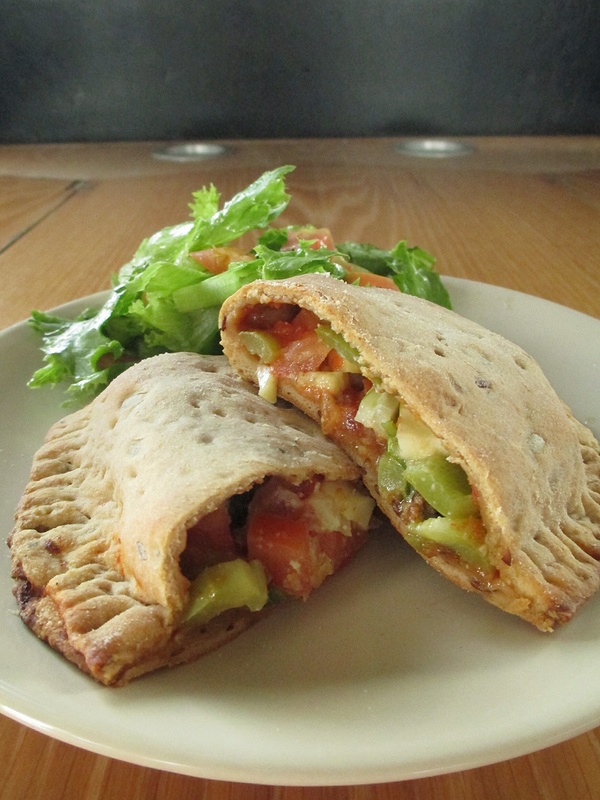 Calzone… kinda like a pizza folded over itself and baked so all the insides mingle together and get all juicy and delicious. With this recipe you don’t need to let the dough rise at all, just rest for 10 minutes or so while you chop up the fillings, so it’s quick and hassle free, which I like! 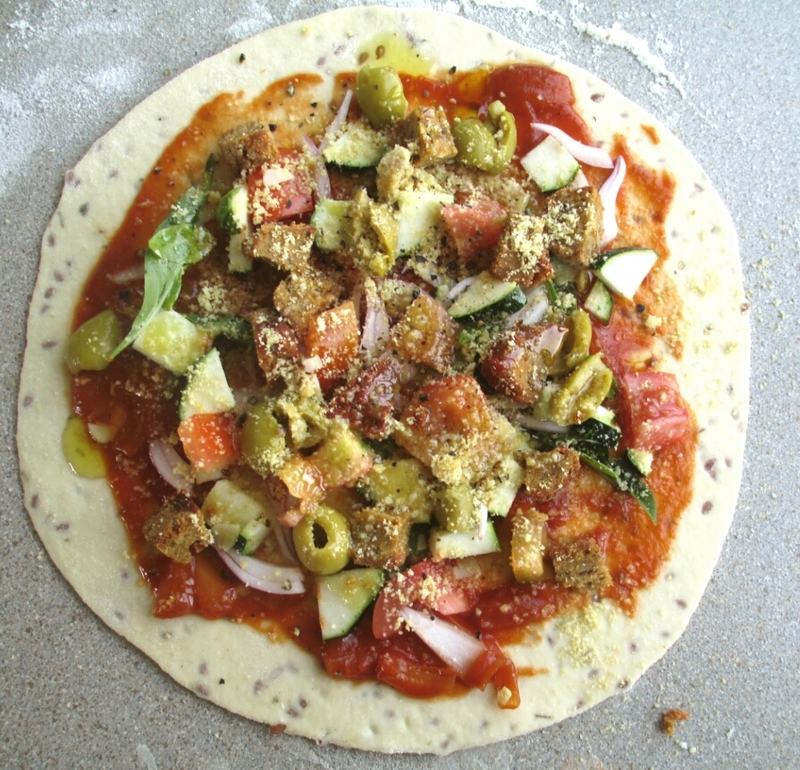 I also use this same dough recipe to make crispy thin crust pizzas! Below is an example of fillings I like to use, but really you can stuff them with anything. I would also recommend trying a filling of thinly sliced portobello mushrooms with garlic, oregano and baby leaf spinach. To make the dough mix the flour, salt, yeast, flaxseed and herbs in a large mixing bowl. Add the olive oil and warm water and mix together with your hands bringing it together to form the dough. Turn out on a lightly floured surface and knead for 5-10 minutes until smooth. Set aside to rest in a lightly greased bowl covered with a damp tea towel whilst you prepare your fillings. This dough does not need to be left to rise for an hour or so like it would if you were making a loaf of bread. After chopping up you fillings quite small, divide dough into 4 balls, then either with your hands or a rolling pin roll out dough to 8 inch circles. To add the fillings, leaving a gap around the edge of about ½ inch, spoon on some marinara sauce, sprinkle over a few handfuls of the chopped fillings, and top with some almond parmasan, a drizzle of olive oil and some freshly ground black pepper. 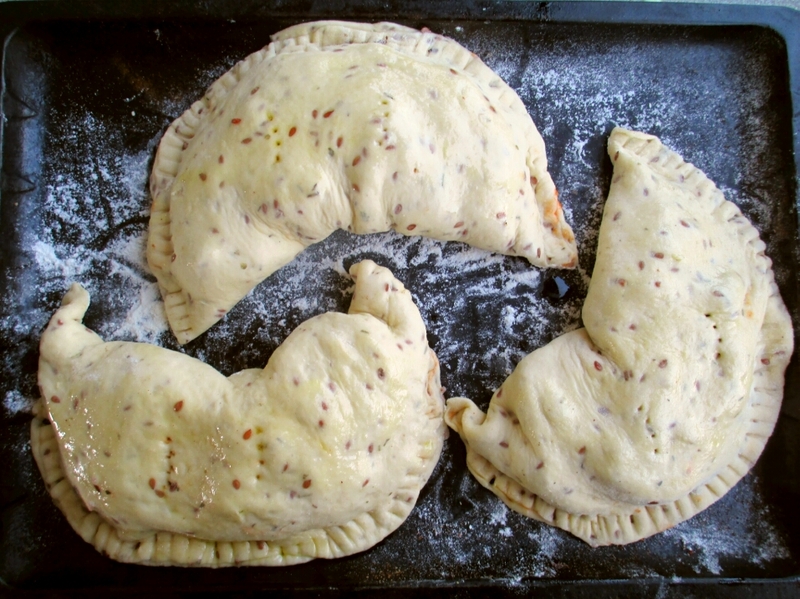 Take the edge furthest from you and fold the calzone over itself so you have a half moon shape. Press the edges together with you fingers or a fork the seal in the fillings. Place sealed calzones on a lightly floured baking sheet, brush with olive oil and poke a couple of holes in the top with a fork. Bake at 200°c for 20 minutes, or until golden. Next PostLearning to Love the Salad!